• Mu & Nin Original Patented Design,Inspired by winter flowers, this beautiful design is easy to combine with your favourite everyday pieces. The rhodium-plated sterling silver earrings come as a pair and are embellished with sparkling clear crystal. They add femininity and romance to any look. • The Highest Quality Standards in Jewellery; Environmental friendly high polished finish Genuine 925 Sterling Silver with Cubic Zirconias, this jewellery shines with beauty and adds a luxurious look. 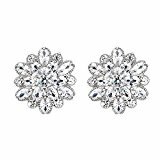 • CZ Color: Clear; Length: 19mm, width: 19mm; Each Earring weight: 1.75g • A perfect accessory to your outfit or as an appropriate gift, e.g.for your Daughter, Lover, Girlfriend, Fiancee, Wife, Mother, Couple, Valentine or just a Friend,etc; Suitable for christmas, holiday, ball, party, anniversary, prom, graduation, birthday or any special occasions; Click on our Storefront for more stylish and newest jewelries. • The item in picture with ornament is same as the real object without PS. • Free Exquisite Gift Wrap: Gift Box ; 30-day Money Back Guarantee.If you have any question with our items or services, please feel free to contact us before you leave negative feedback. We will do our best to solve the problems.